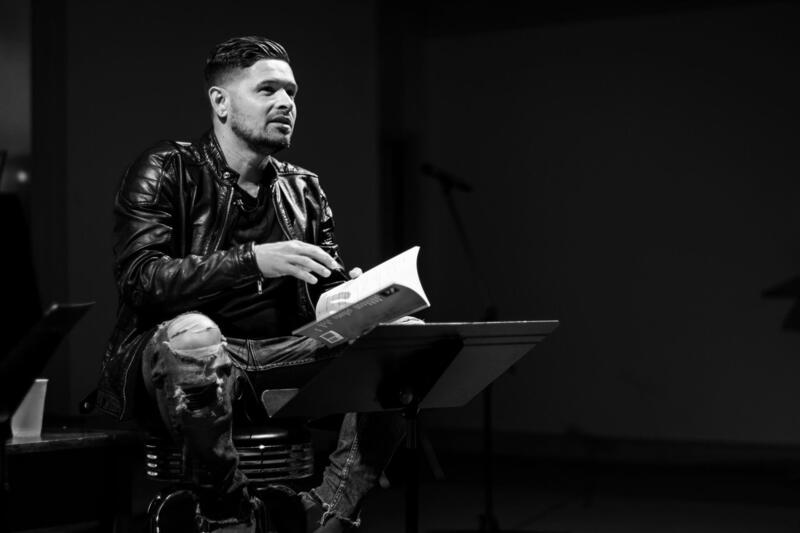 An image from Marley Lizama's one-man performance, "My Spanglish Hip-Hop Story"
Despite a strong Hispanic presence, not much Mexican-American history is being taught in public schools along the border — that is, until now. On this episode of Fronteras, students in El Paso are learning more about a previously unknown chapter of history (0:17). Also on this episode, a SpaceX facility in Brownsville has yet to be completed but residents there are worried if the company’s promises of a launch facility will go unfulfilled (5:34). And finally, Houston poet and performer Marley Lizama talks about how his mother’s unconventional punishments led him to poetry, and how hip hop helped him find his voice (10:57). 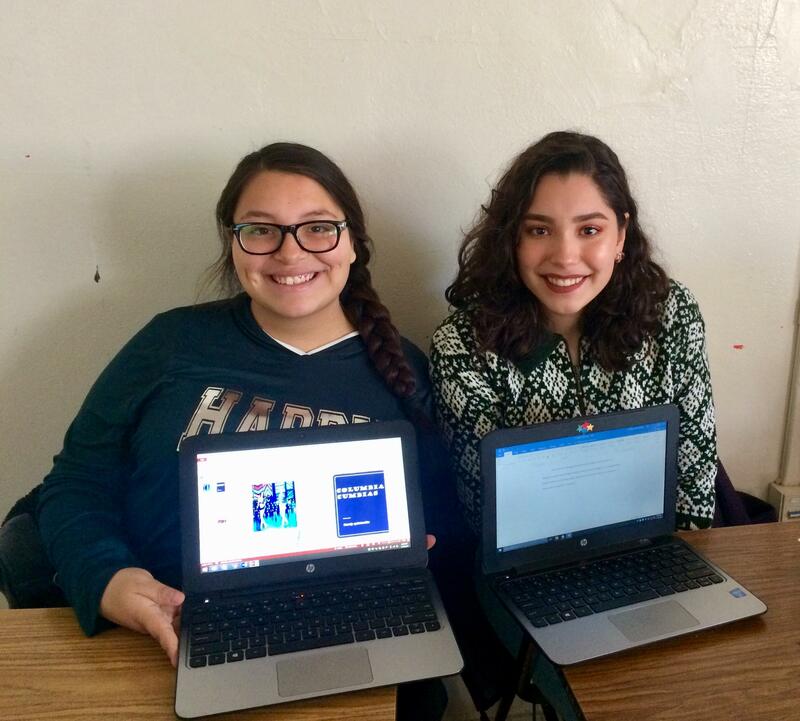 Candy Quintanilla (left) and Luciana Messina, are seniors in the Mexican-American Studies elective at Jefferson High School in El Paso. Since the first big push for Chicano studies in the 1970s, there’s been resistance — a fear that it would somehow dilute “real” U.S. history, or even spark a separatist movement. But earlier this year, the State Board of Education discussed possibly coming up with curriculum standards for a Mexican-American Studies course. The current lack of statewide standards, or even a state-approved textbook, has been a big hurdle for school districts. Even in El Paso, a majority Mexican-American city, a handful of schools just started offering the class this year. El Paso faces the same challenges as other districts and, as Mallory Falk reports, some unique ones as well. The antennas were purchased from NASA, and will track Dragon capsule launches as early as this year. Texans have waited four years to see a ship blast off from Brownsville. Still, no date on when SpaceX's launch pad will be completed. For many nearby residents, frustration over a silent SpaceX outweighs excitement or concern. TPR technology reporter Paul Flahive has more. Houston poet and performer Marlon “Marley” Lizama discovered his love of the spoken word through hip hop. He tours with his one-man show, “My Spanglish Hip-Hop story,” which traces his Puerto Rican and Salvadoran roots, as well as his life in the U.S.
His group Havikoro is made up of dancers, poets and authors, and they have traveled the world sharing their culture and inspiration to international audiences. Lizama is the author of “Cue the Writer: Cheers to the Notion of Love, Hate, God, and Revolution. Despite a call for immediate action from at least two board members during January’s board meeting, the Texas State Board of Education stuck to its agenda and made no decisions in a yearslong push to expand access to Mexican-American studies courses in Texas high schools. TPR's Camille Phillips reports on the State Board of Education's discussion about creating curriculum standards for Mexican-American studies. In 2010, public schools in Arizona were forbidden from teaching Mexican American studies to their students. A group of Republican state lawmakers there argued that the classes created resentments towards other races, and even in some cases, promoted the overthrow of the U.S. government. A U.S. District Court judge is expected to rule on the ban’s constitutionality in the coming days. Educators in Texas are looking past the Arizona controversy and are working to teach public school students about Hispanics’ often-overlooked role in shaping American history. Texas Public Radio’s Norma Martinez sat down with Marco Cervantes, director of the Mexican American Studies Program at the University of Texas at San Antonio, and Lilliana Saldaña, Associate Professor in Bicultural-Bilingual Studies at the UTSA College of Education and Human Development. Texas Public Radio has been following the path of Mexican-American studies in Texas public schools. Last week we visited a San Antonio high school that’s implementing a Mexican-American course as an elective.